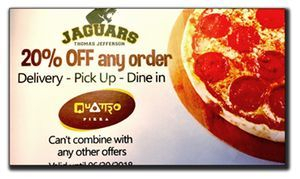 Get your 20% Off Quattro Pizza Discount Card! Enclose $5 in an envelope marked with your child's name, their room number or teacher, your name, and "PTA Quattro Card," and send it in with your student, or contact the PTA. The card is good on any delivery, pick-up, or dine-in order and expires 6-30-2018. The discount cannot be combined with any other offers.